The CobbSasso is the natural choice for consumers interested in slower growing, colored chicken. 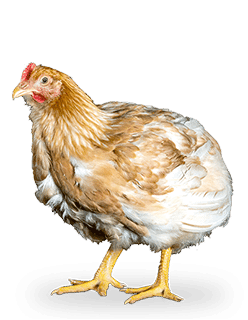 The broiler’s robust health and well being are ideally suited to traditional, free range and organic farming as well as less intensive indoor production. The mating of a rustic brown female and white male give the broiler a distinctive look and excellent growth performance. The CobbSasso conforms to the genetic growth requirements of many established welfare accredited growing programs.